We are glad to inform that Jacek officially joined our team late last year. Our new squad mate has been active in the historical reenactment community for many years. 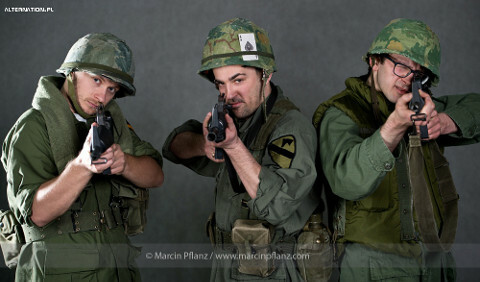 He is a member of the CRONICA Reenactment group and a contributor of the RETROspekcja photographic project. His primary interests focus on the British forces during the Falklands War of 1982. Jacek has joined NAM, willing to develop his Vietnam War impressions. We wish him all the best and a good start at our team. This year we celebrate the 10th anniversary of Nam! 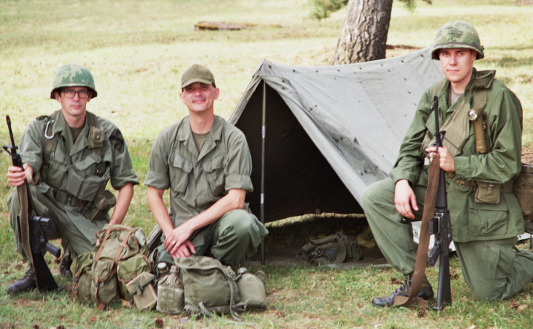 Our team, then called as the NAM Team ASG, was established on April 20, 2007. Celebrating a decade of continuous activity of Nam, we would like to thank all the former and current squadmates. We would also thank to all our friends, fans and supporters. Of course, we don’t stop, continuing to share our knowledge and experience, as well taking part in another events and showing improved impressions, but also to introduce new people into historical reenactment. This anniversary will also be the opportunity for us to publish some commemorative content. So, just stay with us and follow our site and the Facebook page. This Saturday, we will be present in the Armament Museum (Muzeum Uzbrojenia) in Poznań, taking part in the Long Night of Museums. 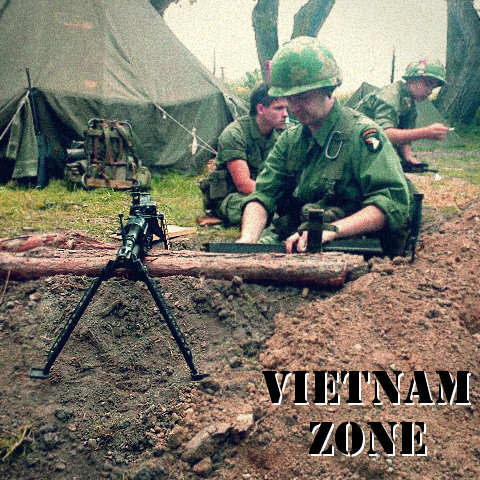 We will show some newly collected Vietnam era equipment, improved impressions and introduce our new squadmates. The event will be held on May 20, 2017 from 5 PM till midnight. The museum is located in the Cytadela Park in Poznań. We are glad to inform that Piotr has recently completed the recruitment process. He has joined NAM as a new squad mate reinforcing the Historical Reenactment Section. We wish our new colleague all the best and a good start at our team. 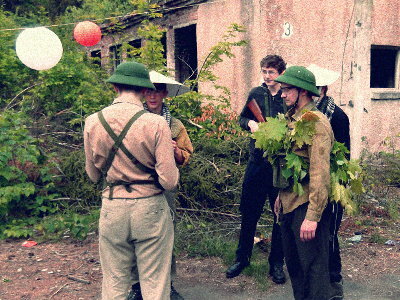 Piotr (on the right) has joined the Historical Reenactment Section of NAM. We are glad to inform that our team will take part in the Aerofestival air show at the Ławica airport in Poznań on May 28 – 29, 2016. 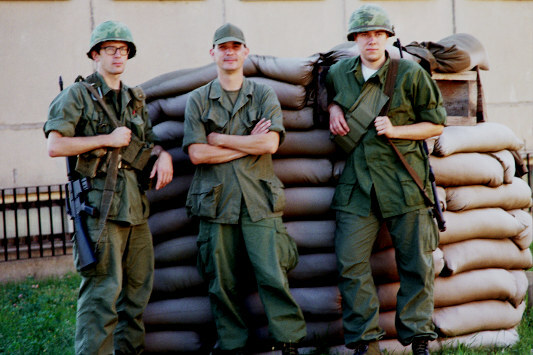 A squad of NAM operatives will be manning the joint post with the friendly associates from the private Museum of Military Vehicles and Weapons and the 173rd “Northern Delay” Re-enactment group. The event’s main appeal is composed of three M151 MUTT vehicles from the Vietnam War, and the Somalia and Kosovo conflicts. An M151A1C MUTT vehicle with a 106mm recoilless rifle manned by NAM operatives during the first edition of the Aerofestival air show. Poznań, Ławica Airport, June 2015. Some aviation aspects and our improved impressions will also be presented during this show. More information on this subject are available on the event’s Facebook page. Meet with us during this great air show! AeroVietnam, an event during the Aerofestival air show. Poznań, Ławica Airport, May 28-29, 2016. 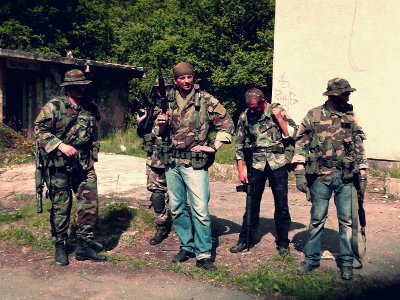 Recalling the last year events, we want to present the summary of the NAMSTOCK: Saigon 1975 Airsoft scenario. The meeting took place in Mieczewo near Poznań, Poland on May 24, 2015. The first phase of the battle saw Viet Congu fighters supported by North Vietnam soldiers (NVA) attacking three checkpoints (CPs) adjacent to the Presidential Palace area. Initially, these military posts were evenly staffed by the South Vietnamese soldiers (ARVN). 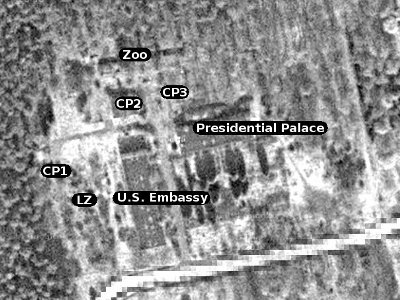 Map of Saigon with checkpoints (CP1 – CP3), Zoo and Botanical Gardens (Zoo), landing zone (LZ), Presidential Palace and U.S. embassy. Firstly, the CP next to the LZ was quickly overrun and captured. The post was attacked by the main communist forces which cut it off from the outside, thus making any reinforcement attempts futile. Next attacks were launched by the communists towards the Presidential Palace. These strikes resulted in capturing the subsequent CPs one by one after meeting the fierce resistance of the defenders, who were supported by other ARVN units located in the palace and the former U.S. embassy. The first phase of the battle concluded in the victory of the communist (i.e. NVA and VC) side, which gained 3 points. The initial success allowed the communist forces to capture the Saigon Zoo and Botanical Gardens (Zoo), one of the oldest such facilities in the world. The zoo itself had a crucial location in the forthcoming operations in the city and became an area of violent fighting when the ARVN counterattacked. The joint briefing of the NVA regulars and the Viet Cong guerrilla insurgents. The South Vietnamese forces had completed the turning movement and engaged the enemy, capturing the first part of the zoo swiftly. The second stage of this skirmish lasted longer and was far more intense as the fighting focused on the nearby building (CP2) allowing to control the large part of the zoo area. Finally, this building was captured and secured by the NVA regulars. Actually, this success came too late as the ARVN entered the second part of the zoo and blew it up, thus rendering it useless to the enemy. This phase saw the victory of the ARVN which gained 2 points. The third phase of the last accord of the Vietnam War was played around the anding zone (LZ) adjacent to the former U.S. embassy. There were speculations that the object once employed during the American evacuation would be used by South Vietnamese officials during their escape attempt. The LZ became the stage of ferocious communist attacks launched from the nearby posts (i.e. CP1 and CP2). The ARVN soldiers repelled these strikes for a long time thanks to riflemen placed in the embassy. The situation started to make South Vietnamese forces victorious even short before the deadline set by the NVA commanders. Finally, a young Viet Cong insurgent, benefiting from covering fire, made his way into the LZ where he set off explosives. 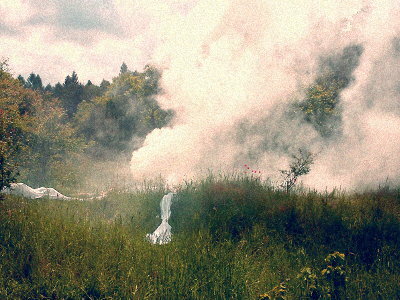 The LZ after the VC attack. As the LZ was put out of action, the NVA and Viet Cong forces gained another one point. The Presidential Palace, a symbol of the Republic of Vietnam filled with the South Vietnamese officials, was the final target of the communist advance. However, the palace wasn’t an easy prey as the NVA and VC troops had to secure the adjacent area. Moreover, the ARVN soldiers focused their efforts on the prestigious building mounting a strong defense from the very beginning. South Vietnamese defenders of Saigon. At first, the NVA regulars and the Viet Cong fighters captured the buildings in the proximity of the palace starting to provide suppressive fire on the enemy. The ARVN defenders were especially hit hard by a sharp shooter in the nearby building. Simultaneously, squads of the elite North Vietnamese sappers launched a series of attacks trying to overrun the palace entrances. These strikes were successfully defeated by the ARVN defenders who withstood well until the end of the fighting and the Presidential Palace wasn’t technically defeated through force. The final stage of the fall of Saigon resulted in the ARVN victory which gained another 2 points. Despite the stalemate, the battle ended in the ultimate communist victory as Gen. Dương Văn Minh, the president of the Republic of Vietnam, announced the surrender of the South Vietnamese government thus ending the fighting and avoiding any additional bloodshed. 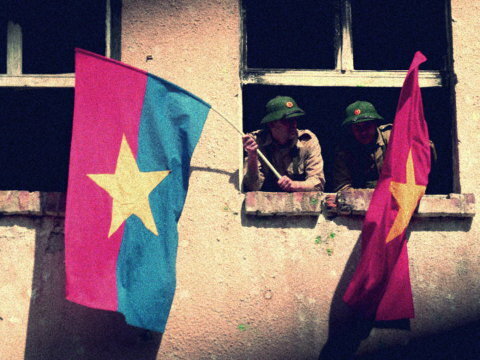 The war was over and Hanoi could celebrate the final victory. Although the meeting ended in a draw 4-4, the most important thing for us was to commemorate dramatic events of April 1975 and to meet with people who share our passion. 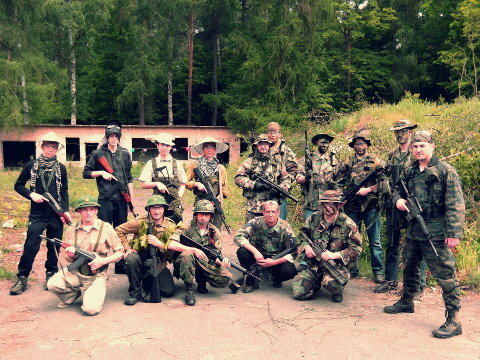 Participants of the “NAMSTOCK: Saigon 1975″ Airsoft scenario. At the end we want to thank to all the participants for their commitment as well the Dzikusy ASG Team for supporting the arrangement of this event. Our team wishes Merry Christmas and Happy New Year to all our Friends and Fans as well the Vietnam Veterans! Have a great time during these days! Spec. 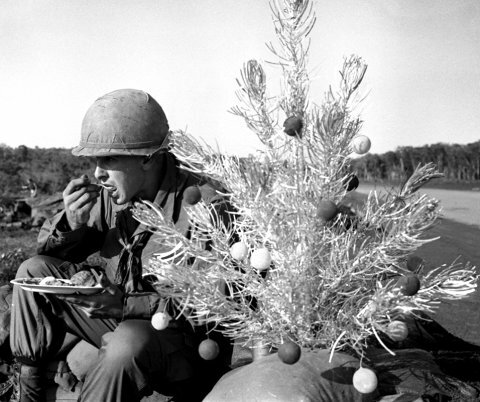 4 Ron Brault of Kansas City, Mo., eats dinner while sitting next to a Christmas tree sent to him by his parents. 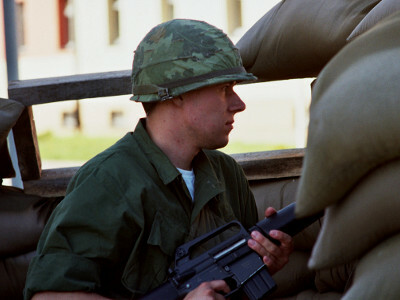 Bu Dop, South Vietnam, December, 1967. Recently, we have started to summarize this year’s events of NAM. This spring saw 15th edition of the Pyrkon Multigenre Fan Convention. Our operatives took part in this event which was held in Poznań on April 24 – 26, 2015. The gathering was an opportunity to celebrate the 8th anniversary of the foundation of our team and to meet with some of our friends. Most of our talks were focused on such subjects as Airsoft, historical reenactment and the cultural references to the Vietnam War. We also recommend the pictures taken during this event. More of them you can find at our online gallery. 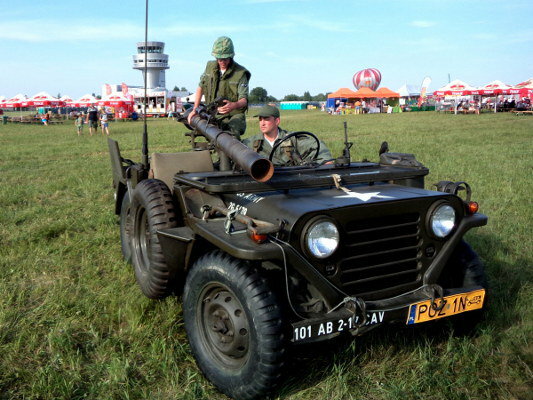 The annual historical reenactment rally “Strefa Militarna” (“Military Zone”) will be held in Podrzecze near Gostyń over 10 – 12 July 2015. As a part of the event, a military camp from the Vietnam War will be organized by the SRH Rakkasans group. A pack of fellow reenactors including some NAM operatives will also take part in this gathering. 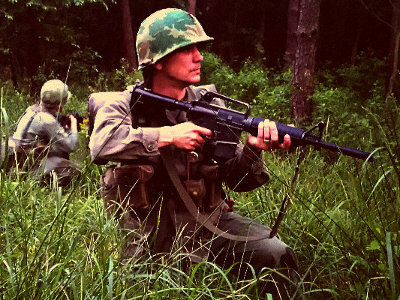 Among the attractions are military vehicles from the Nam Era and a reenactment of a skirmish during the Vietnam War. We strongly recommend you to visit thus created “Vietnam Zone”. More details about this gathering you can find on the event’s Facebook webpage. “Vietnam Zone” during the “Strefa Militarna” (“Military Zone”) rally. Podrzecze near Gostyń, Poland, July 10 – 12, 2015.